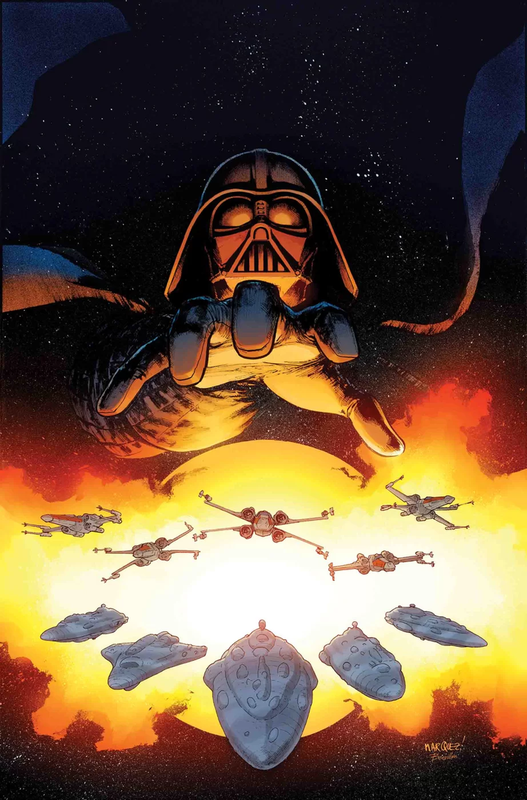 Star Wars #55 finally wraps up Vader’s little battle with the Rebellion fleet. However, as expected, his victory is only a partial one. Most of the Rebels escape, with their fleet intact. And so our heroes find themselves yet again on the run from the Empire. The issue opens with Dodonna returning to the battle and providing a distraction as Han leads some shuttles who free all the remaining Rebel vessels. With the override codes, they’re all able to escape except for Dodonna’s ship which gets its engines disabled. Thus Dodonna meets his end. It’s not the most epic ending for the character. Afterwards, Vader reports to the Emperor and Leia gets new orders from Mon Mothma. She hands out promotions to everyone and instructs them to figure out what to do on their own. Meanwhile, Vader tries to make his battle seem like a victory, but the Emperor sees through it. He calls it satisfactory, which is about how I’d sum up the whole arc. All in all, the story is okay, but it doesn’t really deliver the impact that it could have. I’m not really sure what the point of this battle was. It did not do much to make Vader a more fearsome villain, and it didn’t add much to the Rebellion’s cause either. The Rebels lost some ships they had just gained, they found out Trios was a traitor, and they lost a couple Rebel heroes. It the big scheme of things, it just seemed like a way to kill some time rather than creating some momentous battle. But that’s just my opinion. Art wise, it was a pretty good issue. The characters looked pretty good for the most part, and the action, space combat and ships all looked good. Some of the panels looked really nice, especially with the lighting and coloring effects. With good artwork and an okay story, I give this one a three out of five metal bikinis.